This example shows how to make a 2D contour plot with color mapped to one Z values but contour lines from another Z values. and apply the custom boundary. 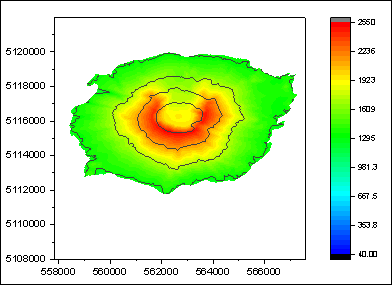 In the attached OPJ file, there is one worksheet with 6 columns, the first three columns, (col(A), col(B), col(C)) are original XYZ data for contour lines, (col(A), col(B), col(D)) are XYZ data of the color map in the contour plot, and the last two columns are for the custom boundary of the contour graph. With the workbook Book1 active, highlight col(A)~col(D), select Plot : Contour/Heat Map : Color Fill to plot two overlapped contour plots. In the following we are going to customize the two overlapped contour plots. Firstly for one contour plot we are going to hide all contour lines and keep color map only. Double-click on the graph to open the Plot Details dialog, and select the second plot in the left panel. And then go to the Colormap/Contours tab, click Line… header to open the Contour Lines dialog. Uncheck the Show on Major Levels Only check box, and select the Hide All radio box. Secondly for another contour plot we are going to hide the color map and keep the contour lines only. 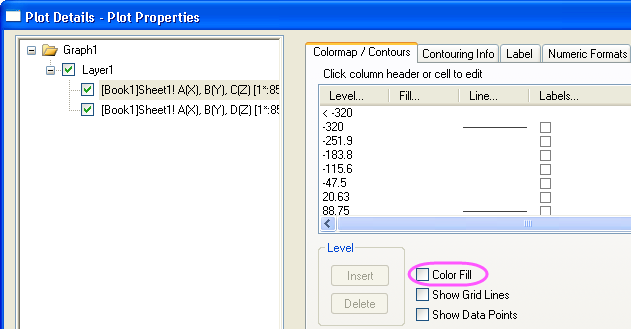 Select the first plot in left panel of the Plot Details dialog, uncheck the Color Fill check box in the Colormap/Contours tab. As these two contours are overlapped, the contour plot only with contour lines will be in the back of the contour plot with color map. To make the contour only with contour lines visible, we can use Layer Contents dialog to change the order of these two contour plots. 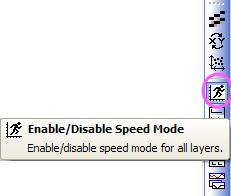 Select Graph: Layer Contents from the main menu to open the Layer Contents dialog. 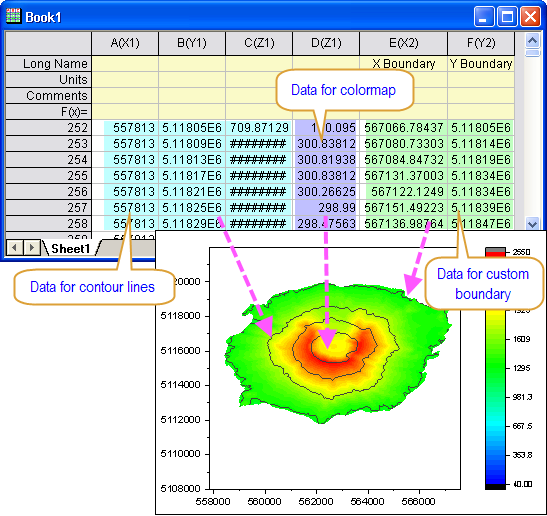 In this dialog, change the order of these two contour plots. Double-click on the graph to open the Plot Details dialog again. Select first plot in left panel, and go to Contouring Info tab. Select the Custom Boundary radio button, and set col(E) as Boundary X Data and set col(F) as Boundary Y Data. Select the second plot in the left panel, and go to the Contouring Info tab. Repeat the 2nd step.